So you’re thinking about a river cruise vacation and you have questions or even doubts as to what a river cruise is all about. Maybe you’ve been on an ocean cruise ship, but really aren't sure if a river cruise is for you — right? Well, we can clear up all those questions with the information contained in this river cruise FAQs page. But, before we jump into the FAQ's, check out the many FREE extras Premier provides each customer, handy items to improve your vacation experience that cannot be had anywhere else except with Premier. When you book your river cruise with one of our expert Personal Travel Planners, you'll receive a copy of Premier's exclusive destination-specific COMPASSPOINT™ Guides, a 30-plus page guide with everything you need to prepare for your river cruise trip. They're the perfect compliment to the perfect river cruise. This exclusive guide is written by Premier's river cruise experts and designed to help you easily sail through every faze of planning, preparing, and most of all enjoying your exciting river cruise vacation. Each COMPASSPOINT™ Guide contains our experts' personal insights on what to pack [including a detailed packing list for men and women], precise weather information, real guidelines for tipping aboard ship and when on shore, and neat suggestions on secret unknown little restaurants and cafes along the cruise route. Premier has also recently introduced our exclusive, Premier Thoughts for most of the pre/post river cruise destinations. Thoughts is exactly what you would think it is, our staff's Thoughts on a destination including all the important sightseeing you need to know about for a short stay in places like Amsterdam, Vienna, Budapest, Prague, Paris and many more. The other highly acclaimed part of the Premier Thoughts are our staff's remarkable local restaurant suggestions. No other travel agency or cruise line provides anything like this and is available FREE when you book with Premier. It is without a doubt the best list of fine local restaurants you will ever encounter, and again, free to customers of Premier River Cruises. We're sure you have many questions about river cruising and what you can expect. below are answers to some of the most frequently asked questions Premier's river cruise experts hear. If there is an area that is not covered below, please drop an email to Ask Mr. River Cruise; we’ll make sure you get a prompt answer, a thank you, and where appropriate we’ll include your question in this FAQ section. Let’s start with the basic question... What is river cruising? In the last five years, river cruising has become one of the “hottest” travel experiences in the world. For the majority of North Americans, a European river cruise allows you to experience a vessel that is, on average, approximately 38 feet wide and up to 440 feet long. All the newer ships have three passenger decks, multiple lounges and dining venues, a gym and many other features found on ocean going ships. While some are longer, most European river ships are bound by the same width constraints as they must fit under and through the hundreds of bridges and locks that are found on the European waterways. One of the most important advantages of a river ship is that while some may carry as many as 200 passengers the average capacity is only around 146 passengers. On other popular waterways which include the Nile River, the Yangtze River, Russia's Volga, the Seine, Rhône and Saone rivers in France, the ships will vary slightly in size and capacity. This is because the rivers are either larger or deeper than those found in Europe, or smaller as are those found in France. While the size of the ships will change outside of the European waterways, the onboard experience is very similar: great attention is always given to providing each guest with an extraordinary and pampering onboard experience. If you are planning for your first river cruise, we suggest you spend a few minutes on our "first timer river cruise" section of the site for more informative tips. Why take a river cruise? Taking a river cruise is a win-win situation for you. Many of the world's most exciting and historical cities are located on rivers; river ships generally dock right in the heart of a town or village, centrally placing you where all the sights are within moments of disembarking the ship. 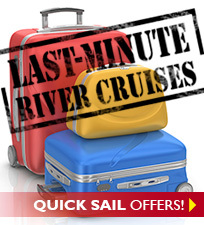 And, unlike "mega" cruise ships that can take hours to get off, you're off a river ship in about two minutes. A river cruise also allows you to experience an in-depth view of the heart of a country or a region, be it Europe, Russia, China, Egypt, or even Vietnam. It is your floating 5-star hotel, train, car, bus, and gourmet restaurant all wrapped up in one. A river cruise vacation offers you extraordinary value for your money and is almost always all inclusive. Much of what you have to pay for on an ocean cruise or a bus tour is included: complimentary shore excursions, beer, wine, and soft drinks with dinner, bottled water in your stateroom and round the clock specialty coffee and teas. You will NOT get nickeled and dimed to death for every little item on a river cruise. River cruising is a near perfect combination of sightseeing and relaxation. You decide whether you want to do all that is offered and included, or whether you just want to sit on the sun deck taking in all the incredible views. If you truly want to experience a destination up close and personal, then a river cruise is for you. And did we mention you CANNOT get sea sick on a river cruise ship – that just cannot happen. Where can I go on a river cruise? You can enjoy a river cruise on every continent except Antarctica. Currently, the most popular rivers for first time river cruisers are in Europe and include the Rhine, Moselle, and the Danube in Western and Eastern Europe, the Rhône and the Seine in France, the Douro in Portugal and the Volga in Russia. River cruising is also common in China on the Yangtze River, on the Nile in Egypt, and is starting to catch on in Southeast Asia along the incredible Mekong River which flows through China, Vietnam, Thailand, and Cambodia! When can I go on a river cruise? River cruises in Europe sail March through December, in Russia, from May till early October, and in Southeast Asia, almost year round. Please check with our team on more remote river cruise destinations. What is the difference between a river cruise and a barge cruise? Really, the two basic differences are size and cruising area. Because barges operate on smaller tributaries and rivers, they are very restricted as to their size. Therefore, barges carry fewer passengers, generally not more than a couple of dozen — and that only on a few of the larger barges. You will most likely not travel more than 50 or 60 miles and remain in one small area of a region, for example the Loire Valley in France. Barges are wonderful if you have a small group of close friends who have common interests, but may be somewhat risky if it's just the two of you traveling. Because of their size, river barges have very little common area, usually only where you dine and a small lounge. In addition, while the food is exceptional, the menu is very restrictive with limited selections each night. River cruises may cover several hundred miles and can allow you to enjoy the history, culture and marvelous sights of several countries with many like-minded and similarly-aged passengers. On a river cruise, your ship acts as your floating hotel, albeit a very deluxe hotel and affords you many of the amenities found in a four-star hotel or upscale cruise ship including delightful staterooms and suites, a wide selection of wonderful menu items including fresh fish and regional specialties, and even complimentary internet. What is included in my price? Unlike most ocean cruises, just about everything is included in your price. Really comprehensive shore excursions in each port are included, gourmet meals and snacks while on board including complimentary fine wines and beers at lunch and dinner. Teas, specialty coffees and bottled water is also alway available and free. So, really on most river cruises the only extra you can anticipate are onboard gratuites to the ships staff and small gratuities to your local guides. Other than that, you would need to pay for drinks at the bar [generally around $6] unless you are on one of the lines that is "all-inclusive." What is an "all inclusive" river cruise? A river cruise that is all inclusive includes absolutely everything in the price you pay, so once on board you never need to pay for anything at anytime. This includes all alcoholic beverages while on board, all gratuities to ships crew and tour guides, and there are NO optional tours. Literally, you will never put your hand in your pocket when you purchase an "all inclusive" river cruise vacation. Currently, Tauck, Scenic and Uniworld provide an all inclusive river cruise experiences New commer Emerald, includes everything, except spirits at the bar. What is the difference between a river cruise and an ocean cruise? Again, the basic differences are size and cruising area. A river cruise ship will carry on average about 150 passengers in a comfortable and intimate setting. Ocean going cruise ships will carry thousands of passengers with whom you will be competing for limited shore excursion space, dining venues and dining times, not to mention the time of getting off and then back on the ship at each port. Yes, a big cruise ship has lavish entertainment and Broadway shows, but is that truly what you are looking for on this type of experiential vacation? Another important key difference is that on a river cruise, you will actually see more of the countries you visit, including stopping at various small towns and villages, while on an ocean cruise you may not see more than the harbor of a major port city. River cruise ships also stay longer and later in most ports because they travel less distance than an ocean going ship. Because you generally dock right in the heart of a city, you’ll even have time to take a stroll through town after your dinner. And don’t be fooled by ocean cruise itineraries that sail between cities such as Athens and Rome or Paris as you don’t actually dock in these cities. For example, Paris is two and a half hours away from the port of Le Havre and Civitavecchia, the port for Rome, is almost two hours away from the city center. Do I have to get dressed up on river cruise? No, river cruising is a very informal style of cruise and the dress code if you will is more like, "resort casual." When you book with Premier, our Compass Point Guide will provide you all the in's and out's of river cruising and how to pack for one. It's like "river cruising for dummies," and is certainly the best river cruise planning guide available anywhere... and you won't get this from any cruise line or any other travel agency. What does one do on a river cruise? River cruising is destination driven providing you a lifetime of fond travel memories. It focuses on providing you with an up close and personal view of a region or country. River cruising is all about sightseeing on the included shore excursions, cruising of course, and relaxing and meeting new friends. Most of the complimentary shore excursions will visit the key points of interest in each city; and because you don't spend so much time getting to and from the ship, there is also ample free time available to shop or explore on your own. Even better, if you’ve ever been part of a large group on a sightseeing tour, you know what it is like to be in the back and have to strain to hear the tour guide… well that won’t happen on a river cruise excursion. That’s because once on board you’ll receive your own personal state-of-the-art Quietvox wireless audio headset system that allows you to hear every word crystal clear. Depending on the itinerary, you may cruise during the late evening or through the night, although you will almost certainly cruise during the daylight hours when traveling pass scenic areas such as the Upper Middle Rhine Valley in Germany to see all the castles or the beautiful Wachau wine valley in Austria. While you will not find lavish Broadway style shows on a river cruise, youll be able to enjoy nightly live entertainment generally consisting of a vocalist with musical accompaniment. To improve your enjoyment of the region, local folkloric entertainment will also be featured on many evenings. To improve your understanding and enjoyment of each destination, most itineraries now include local lecturers about where you have been, or are going, so that you have knowledge of the significance of each stop. I just have to break away from the FAQs for a moment, and tell you about one great experience… Something we found amazing was that one day while the ship was cruising and we were taking a nap in our stateroom before dinner I suddenly awoke because it was dark — it was the height of summer with long days — what was going on? I then looked out the floor to ceiling windows of my French balcony to see the wet, very close sides of my first ever river lock. Once I understood what was happening, I was fascinated. Could not believe we were so close — about 14 inches or so; could not believe we were so far down it seemed to block out all the sunlight. The fact was that we were about 60 feet below the top of the lock at that exact moment — you won’t believe it when you experience this effect for the first time — it was so cool! What amenities will I find on a river cruise ship? Amenities now abound on most of the major cruise companies' vessels. Pools and spas are becoming more commonplace, bicycles for use while in port are available with several companies, and most vessels have a small fitness center where you can work off the calories from the meals that are truly gourmet both in preparation and quality. Today's modern river cruise ships have multiple restaurants and bars, great public space including a wonderful forward looking lounge that allows 180 degree panoramic views if the weather should turn cool. The very top deck, usually called the “sun” and is where [weather permitting] you can enjoy outdoor dining and the ships BBQ. It’s also where you can relax with your favorite drink in a lounge chair, enjoy shuffle board or even a refreshing dip in the jacuzzi. Within your beautifully appointed stateroom or suite you will enjoy lush bathrobes, bathrooms stocked with L’Occitane [or similar] bath and body products and of course an incredible river view [There are no inside cabins on a river ship.]. Most of the river cruise companies that we sell at Premier now also provide a complete selection of in-stateroom entertainment including live [Stateside] news and sports programming, shows on the shore excursions and what to see and do in each city. There is also a great selection of free hit movies and of course, music. What about airfare? Ah, the bain of all travel, airfare. At Premier we have a special air department that will assist you in obtaining the best airfare at the best price and routing... That's part of our service and another reason to deal with the best travel agency in American to book your river cruise. What type of food can I expect? While you may not find food available 24 hours a day as on an ocean cruise, and while the concept of the midnight buffet has not yet caught on [We say bravo to that! ], the meals onboard a river ship are 4-star, delightful and offered up by a service-focused and warm wait staff. ost of the top river cruise companies employ world-class culinary teams who prepare all food using the freshest local ingredients. American style breakfast is served buffet style with a large variety of cereals, fresh fruit and juices, meats, yoghurt, pastries, and an omelet station where you can have your favorite omelet made to order. Yes, you can also get pancakes and waffles made to order as well. Lunch is a combination of buffet style and table service with soups, salads, meats and fish [hot and cold], fresh homemade breads and a carving station. The choice is yours, sample the selection at the buffet or enjoy the table service menu — or do both! Dinners feature very attentive table service from exceptional wait staff. Menus generally offer a wide selection of freshly made starters including soups, salads and fabulous appetizers. Your entrée choices generally include a fish dish, beef selection, vegetarian and/or pasta course. There is also an entrée or group of menu items which reflect the cruise region you are in. Most river cruise companies also provide complimentary wine, beer and soft drinks at the evening meal. Depending on your destination, some warmer weather itineraries will offer a topside traditional BBQ featuring delectable fresh lobster and seafood and, of course, a great steak. Most companies also now offer complimentary bottled water in your stateroom and 24-hour specialty coffees and teas. What is the atmosphere like onboard? River cruising's appeal is universal. It attracts a very broad group of people and a wide range of nationalities, particularly from English-speaking countries. Many people taking a river cruise will have taken an ocean cruise. 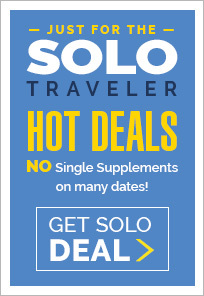 Almost all are seasoned travelers who are looking for a vacation without the crowds, with something unique that neither ocean cruising nor bus touring can offer. Yes, the majority of passengers on board will be from either the United States or Canada, but you will also find a nice sprinkling of passengers from Great Britain, New Zealand, and Australia. A relaxed and casual atmosphere is the order of the day onboard. Generally speaking you can leave your gowns and tuxedos home. Cruise companies don't usually identify dinner times as "formal". On most cruises, you'll most likely see something that indicates Captain's Welcome or Farewell Dinner. In this case, formal means country club evening wear. The only true necessity to bring is a comfortable pair of walking shoes for the many included shore excursions which, best of all, you can participate in as much or as little as you desire. Generally speaking, each night before dinner there will be entertainment or a lecture and time to relax with new friends to talk about the day's events, or to share a beverage of your choice. Can I bring my child on a river cruise? Traveling to Europe, China, or Russia can be beneficial to many young people as it exposes them to different cultures and places. Family-friendly or multi-generational cruising has long been an established aspect of ocean cruising but it has not made that much headway among the river cruise companies. Some, most notably Uniworld, who pioneered this concept in the river cruise world, have identified a couple of itineraries where they will offer a few departures, usually during the summer months, with special programs designed with families in mind. During the summer months especially, you may find teenagers and younger adults but it is extremely rare to find children younger than 8 on a cruise. There just is not that much for young children to do and ships are simply not equipped for young age groups. One other important factor is that many cabins, including suites, accommodate only 2 passengers. A couple with a teenager may have to buy 1 cabin at a double rate and another at a single supplement to accommodate all 3 travelers. What does the term "waived single supplement" mean? It refers to the fact that on select sailings, there is no additional fee charged for a solo traveler to occupy a stateroom designed for two people. Some cruise lines still charge a fee for a solo traveler to occuply a cabin for two. Can I bring my electric scooter on my cruise? Unfortunately not and that is because of size constraints on river cruise ship corridors. You may bring a collapsible [less than 42 inch] wheel chair that may be used ashore. Almost all modern river ships do have elevators. Should I upgrade my stateroom? Excellent question! And perhaps the one issue that most concerns passengers when choosing where to stay on the ship. Unlike ocean cruise ships, no matter which stateroom you select, you will never be that far from the common areas and you will always enjoy an outside or as we say, a river view stateroom. Elevators are now common on many of the newer builds, so if you are situated on the lower or middle deck you can bypass the stairs to get to the main deck and lobby area. Generally speaking, all non-suite staterooms on a vessel will have the same square footage and same in-room amenities such as a hair-dryer, safe, flat screen TV, deluxe bath products and more. Suites, of course, are significantly larger and will usually have extra amenities a separate sitting area and of course a full or French balcony — ah, breakfast with a view. Staterooms on the lowest deck usually have 2 smaller square windows or 1 small rectangular window that does not open. You will always be just above the water line in these cabins. While the minimum cabin category is basically the same layout and design as on one of the two higher decks, we believe it is well worth the extra money to upgrade from these cabins. Staterooms on the middle and upper decks generally have either large floor to ceiling windows, French balconies or full private balconies with room for a couple of chairs and a table. The view you gain from a “balconied” cabin or one with floor to ceiling windows is as they say, “priceless!” It’s your vacation, so splurge! From our perspective, there is absolutely nothing like going to sleep with the door open. The almost nonexistent sounds of floating down the river are sounds and memories you will never forget. Best of all you can turn off the air conditioning and enjoy the fresh air. And yes, you can also reach out and touch the walls of the various locks as well. Is one side of the ship better than the other? Another very frequently asked question! The true answer is that both sides of the ship present an equally fascinating view of the river and its sights. During those periods when your ship is cruising, you will find that most of your fellow voyagers will elect to view the sights from either the comfort of the forward-facing and very comfortable lounge, with its panoramic 180-degree views, or from the sun deck with its 360-degree views. Depending on the river, the itinerary, and which side of the river the port is, some days your cabin may face the shore while on other days you will face the river. Occasionally, river cruise ships dock next to each other and you may have to cross through one or more vessels to reach the shore. Rest assured that this is normal. Where a ship docks is in the purview of the port’s Harbor Master, not the ship’s captain. What is the difference between a window [riverview] stateroom and a balcony? Generally speaking, everthing is the same except, riverview staterooms are on the lower deck and provide one or two nice size windows that do NOT open. Depending on the ship, a balcony stateroom may provide a French [no actual seating] style balcony or a "sit down" style balcony. On most ships, the riverview staterooms are the same size as French balcony staterooms. The biggest difference is in the price because you will generally pay atleast $600pp more for a balcony, so if on a budget, go for the window stateroom, especially in early spring and late fall. Do river cruise ships always dock in the center of a town? This really depends a lot on where you are. In Europe, 90% of the time you will dock within a short stroll to the town or city center. Occasionally a port is outside the center of a city and a complimentary motor coach may be necessary to get to the main tourist areas. In Russia, river cruise ships in Moscow and St. Petersburg dock well away from the center of each city – complimentary bus shuttle service is available — or if you feel adventurous, each city's metro has a stop near the docks. How much walking is involved on shore excursions? Many of the shore excursions will involve walking — up and down flights of steps, through shrines and ancient temples, and, especially in Europe, on cobblestone streets. Comfortable clothing and sturdy walking shoes are a must. In the spring and fall/winter months you want to ensure you have layerable clothing to allow for temperature and weather variations. Please be aware that unfortunately, most river cruise ships are not wheelchair accessible. Is there nighttime entertainment on board? All most all river cruise ships will have entertainment each night — usually a singer, musician or an exciting local performing group, depending on the port and itinerary. While a river cruise is not an ocean cruise and there will be no Broadway-type shows or extravagant musical performances, there is plenty to keep you active at the cocktail hour and after dinner. All river cruise ships have well designed and tasteful lounges where passengers usually congregate after dinner to enjoy an after dinner drink, a performance, or just to meet and enjoy new found friends. Can we extend our river cruise? Yes, most definitely. Every cruise company offers a number of pre and post land packages. They usually range from 2-3 nights at a centrally-located first class or deluxe hotel with daily buffet breakfast included. Coming in early is a great way to relax and refresh oneself after a long flight and acclimate to the time change — we strongly recommend it. You do not usually have an overnight on the ship in your embarkation port, so doing a pre-hotel stay is a great way to explore a city such as Amsterdam, Vienna or Budapest. 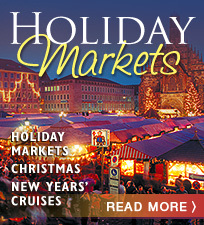 Most of the river cruise companies now include pre and/or post cruise packages in your cruise. Staying on at the disembarkation port is also a great way to unwind from your cruise in preparation for the return flight home. What better way to further explore and experience the major cities that usually begin and end a river cruise. Is there internet access on board? Most river cruise ships now provide internet access and have Wi-FI capability available either in the public areas or in each stateroom. Internet usage is usually free of charge, although some cruise companies may charge a nominal fee. Please note that service may not always be available during certain times such as when ships go through locks or pass through deep river gorges. Is there a dress code? The dress code on most river cruise programs is informal and casual during the day and while on shore excursions, with country club casual dress recommended for dinner. We would suggest that jeans and/or tee shirts are not appropriate at the evening meal. For your shore excursions we urge you to bring along comfortable walking shoes and clothing that can be layered to accommodate cool and/or hot days while you are touring. Layerable clothing is of particular importance for you on spring and late fall cruises. If you choose to enjoy one of the fabulous Holiday or Christmas Market cruises, your Premier cruise expert will provide you a more detailed look at clothing. Generally on every river cruise there are usually 1 or 2 more [depending on length of cruise] "semi-formal" nights. On these fun-filled nights passengers are encouraged to dress up just a bit, but formal attire (i.e., tuxes for men and evening or cocktail dresses for ladies), are not required. A sports coat [without tie] for the men and an appropriate casual dress for the ladies would be perfect. Are staterooms air conditioned? Yes, staterooms and suites have individual climate controls to regulate both air conditioning and heat. All enclosed public areas also have climate controls. Is laundry service available? Laundry service is available on all ships for a fee. Some cruise companies have ships equipped with self-service washers and dryers. Clothes that need to be dry cleaned are usually sent out; service depends on where the ship is docked at any particular time. Is there a doctor on board? River cruise ships generally sail close to shore. In the event of a medical emergency a doctor can be summoned and be on board very quickly. River cruise ships in Russia and in China usually have a doctor on board for each cruise. Are the ships smoking or non-smoking? All river cruise ships are non-smoking in all interior public areas and in all staterooms. Smoking is allowed in certain, specific outdoor areas only. What does the term "ramping" mean? This term is often used when one river cruise ship docks next to another river cruise ship. It is done because of the scarcity of dock space in some ports and the term flows from the metal ramp that connects the two ships and allows passengers to get on and off the connected ships. It has no impact on your cruise and is rarely done. Can my family and friends contact me on board? All river cruise ships can be contacted by phone or by e-mail. A list of contact numbers will be provided to all passengers prior to departure based on the cruise company and ship booked. I am on a special diet. Can my dietary needs be accommodated? While not all special diets can be accommodated (kosher for example), in most cases your dietary needs can be met. Every reasonable effort will be made to accommodate requests made in advance. What type of electrical current is found on board? Will I need to bring a converter? Electricity on board most river cruise ships is 220v. Bathrooms generally have a dual 220v/110-120v plug for shavers and small appliances. You will need an adapter or converter to use in other outlets in the stateroom for any small personal items such as a razor or a curling iron. Ladies, most modern river ships come with a hair dryer in the cabin. Gratuities. The service levels on most river cruises is extraordinary. Gratuities are always at the discretion of each passenger, based on your evaluation of the service rendered. Tipping guidelines can vary based on destination and river cruise line selected. When you book with Premier, our exclusive "Tip Sheets" will take the mystery out of tipping and our staff's unique apporach and guidelines will make you feel like a river cruise pro. How do I pay for things such as drinks, gift shop purchases, and optional shore excursions? Cruise lines usually open a personal shipboard account for each passenger upon check-in. All onboard purchases are billed to this account and upon check-out each passenger receives a total which can then be paid with cash (dollars, euros or local currency usually accepted) or can be charged to a credit card. While the dollar is widely accepted, it is no longer the currency of choice in many places. Depending on your cruise itinerary, you should plan to bring along an ATM card to transact currency conversions. The fees are much lower than are traditional currency exchange transactions. Do check with your ATM card issuing back for the details and fees associated with your card. What is a Shipboard Credit/Onboard Cash and how can I use it? A shipboard credit – also known as Onboard Cash – is just like cash, but has no cash value. It may be used on a river ship to pay for items such as; hair salon, messages, items if the gift shop, bar purchases, optional shore excursions, photographs, and to pay all or a portion of your onboard gratuities. Premier River Cruises' 2012 Early Booking promotion provides up to $500 in SHIPBOARD CREDIT to those booking a 2012 river cruise with Premier prior to August 31, 2011. Can I buy liquor ashore and bring it on board? Generally speaking, yes, although if you wish to have your own wine with lunch or dinner most cruise companies will charge a corkage fee. Remember, on most river cruise ships, complimentary wines and local beers are included with the evening meal. And, just because they are complimentary, don't expect them to be inferior, they are not! Should I purchase Travel Insurance? Travel Insurance Protection. In most cases, once it is purchased you are protected if you have to cancel for a "covered" reason. If you do not purchase insurance and need to cancel, the cruise line WILL NOT refund your money irrespective of what caused the cancellation, even the death of your traveling partner. For complete details on insurance offered by Premier, please click here learn more about travel insurance. What if any documentation will I need for my trip? All passengers should check with the respective countries included in the itinerary, as to the necessary documents required for the countries they will be visiting. For Premier customers, your Premier river cruise expert will make sure you have all the current visa and passport information and assist you where needed to expidite the process. We hope that you’ve found our FAQ section beneficial in learning more about river cruising. Remember, please don’t hesitate to call 1.855.255.1200, or email Sales and Reservations, if you’re ready to book your cruise, or if you still have unanswered questions. 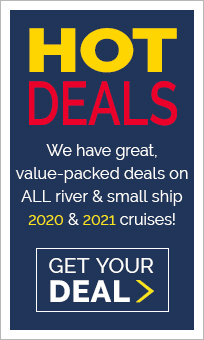 Thanks for taking the time to read this section and we look forward to helping you book a value-packed and enjoyable river cruise vacation very soon!